Despite rising tension with North Korea and two hurricanes, optimism continued to fuel market growth with investors anticipating fiscal stimulus via tax cuts. Amid benign inflation, low interest rates, and solid S&P 500 earnings, the environment remains bullish for equities even though valuations are extended and the Federal Reserve is tightening. Domestically, small caps reversed the recent trend and outpaced large caps. However, growth stocks continued to outperform value, but that trend reversed in September. Abroad, improving economics and a weaker dollar enabled international stocks to outpace US stocks, with the greatest outperformance coming from the emerging markets. 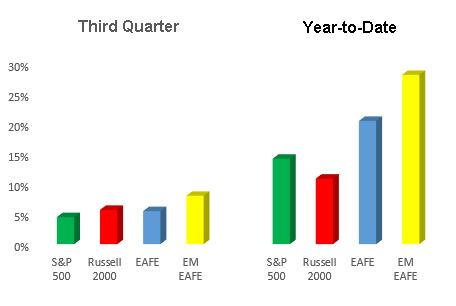 For the quarter, the S&P 500 was up 4.5%, the Russell 2000 gained 5.7%, the MSCI EAFE Index returned 5.5%, and the MSCI Emerging Markets Index grew a little over 8%. Year to date, the S&P 500 is up 14.2%, Russell 2000 has gained 10.9%, the MSCI EAFE Index is up 20.5%, and the MSCI Emerging Markets Index is up 28.14%. Oil prices remained at or near $50/barrel due to OPEC continuing its production cuts. However, US production and the potential for increased production has kept prices from moving higher. As a result, commodities turned in a positive quarter but remain off 3.49% year to date. Real estate continues to lag overall stocks, but global infrastructure continues to outperform. Year to date, REITS are up 3.14%, and infrastructure has gained 16.77%. In September the Fed announced that it will begin to reduce its balance sheet. Since the financial crisis in 2008, the Fed’s balance sheet has grown to $4.5 trillion from $1 trillion. To avoid disrupting the markets, the pace of reduction will be small — initially starting at $10 billion a month and eventually ramping up to $50 billion a month. 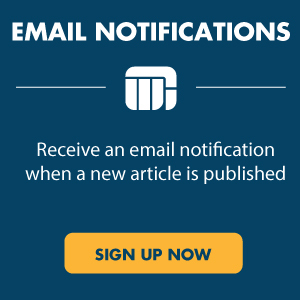 The Fed also announced that it expects to raise rates in December. 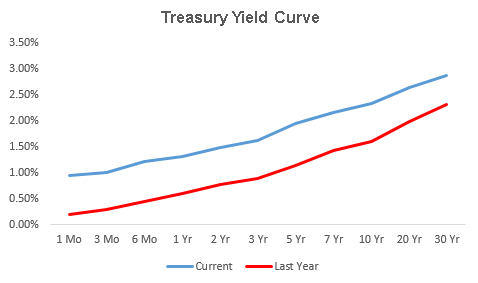 That announcement pushed interest rates higher, resulting in a rise all along the yield curve; however, with movement at the long end being muted, the curve continued to flatten. The 2-year Treasury increased 9 basis points to close yielding 1.47%, while the 30-year Treasury gained 2 basis points to close yielding 2.86%. As with equities, risky fixed income assets outperformed high quality bonds, with high yield bonds, emerging market bonds, and floating rate debt posting solid results. Year to date, high yield bonds have returned 7.6%, emerging market bonds have gained 14.7%, and floating rate debt has returned 3.32%. Our risk management strategies, as often is the case, provided returns that fell in between the returns provided by stocks and bonds. Managed futures continued to lag the group while hedged equity led. Although the markets seem to be complacent about risk, risk remains high due to extended valuations. While this does not portend a correction any time soon, it does mean that long-term returns for both stocks and bonds could be below historic norms.